In the 400 years since the end of Earth, human society is a vastly different place on the Planet Loka. There are levitating cars, strange monstrous creatures, and babies that are suddenly taken by the government without any explanation. Best friends Kayla and Mishalla were not born of birth mothers in this world, but were designed to be GENS, Genetically Engineered Non-Humans. Each GEN is enhanced with special skill sets that make them desirable workers for trueborns, who are the wealthy, high status members of society. When Kayla is assigned to work for a dying trueborn named Zul Mandel, she must leave her nurture family and the only home she’s ever known–and forced into close proximity with his all-too-attractive grandson Devak. The GENs are really slaves, forced into servitude and at the mercy of a cruel caste system that treats them as lower than the lowest born human. Skin color, clothing, jewels, land, drugs, and levitating cars are all blatant status symbols in this world, and it’s interesting to see how the author works in echoes of previous shameful world events in the segregation of the GENs, the widely-held belief that touching a GEN would result in shriveled skin or crooked bones, and even in the saying “Work will make you safe,” which is of course derived from “Work makes us free” from Nazi Germany and “Be happy in your work” from the The Bridge Over the River Kwai. These themes are all intelligently and subtly worked into the book in a way that never feels too blatant or pretentious. Once the story got going, there are plenty of exciting events and issues to think about. I was fascinated by the well thought-out society as well as the presentation of the two very different religions to which humans and GENs subscribe. There is finely built tension in several “search and seizure” type scenes and there were moments when I felt terrible pity and sorrow for the characters, including the first time Kayla comes upon the gorgeous Mandel house and sees the shocking contrast to the slums where GENs are kept, and Kayla’s constant, devastating fear of punishment by being “reset,” which wipes out all of a GEN’s existing personality but retains his or her body for recycling and reuse. There are a couple of really nice, slow-building romances in this book, but as the relationships between Kayla and Devak and between Mishalla and Eoghan develop, the young protagonists also discover who they really are and what they really stand for. Some of the best parts of the book are the forbidden, snatched conversations between Kayla and Devak as they discuss what makes someone beautiful, what makes someone kind, and most importantly, what makes someone human. I do wish that the bookends to the novel were a little longer, as the beginning was a little abrupt and all the new names and rules and creatures took some getting used to. A little more time showing the friendship between Kayla and Mishalla before their Assignments would have helped as well. The ending chapters following the climax could have been a little more developed too, as they felt a little rushed to me and some of the details involving Devak’s father were a bit sketchy. Still, this was an immensely enjoyable dystopian novel with excellent character development, a complex story, and nuanced themes, with everything I had hoped for from A Long, Long Sleep and Matched, but didn’t quite get. The ending leaves the door open a bit for a possible sequel, and I for one would very much like to visit Kayla’s world again. 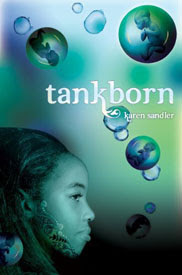 Tankborn is one of the first books from Lee & Low’s new Tu imprint, which is dedicated to publishing YA books with protagonists of color. The majority of the characteristics, society, and customs in this book are derived from East Asian and African-American influences, and if this is an indication of the type of products that Tu will be producing, then sign me up as a dedicated fan. This is the sort of young adult literature we can definitely use more of–books that not only feature more diversity and world views, but ones that are also thoughtfully conceived and exceptionally well-written. Thanks so much–I hope you all enjoy it as much as I did! Definitely a great one for anyone who loves dystopian novels. definitely has a great cover and concept, i just don’t really read many dystopians. great review! Wow, I didn’t know that about the publisher. That’s great. I’ve contemplated reading this one for awhile..
Glad to see another good one from Tu! I really enjoyed Wolf Mark. I admit I skipped over Tank Born because the blurb didn’t really grab me, but your review has me smacking my forehead. Sounds like a great story, and now I’ll have to track down a copy…I love really complex, smart dystopia. Aww, this book sounds so cool! I love, love, LOVE dystopian books right now, so you can bet that Tankborn is definitely a book I’d love to read! I thought both those elements were really well thought-out too, Selina. I really hope people find this book and read it! I think you might like this one, Cassi. The galley was on NG for awhile, but it may have been taken down since it was just released. I’m very curious about this book. PS where’d you get the galley? Great review! I highly enjoyed this book and in particular the dystopian society based on the Indian caste system and the philosophic questions around what makes someone human.